Resulting from 20 years of experience in electrical mobility, Peugeot 2.0 is today the most advanced electric scooter on the market, with its removable battery, robustness and connectivity. It is attractive for consumers, ideal for professionals, and the worthy heir of the American “pick-up” spirit with its large loading capacity. 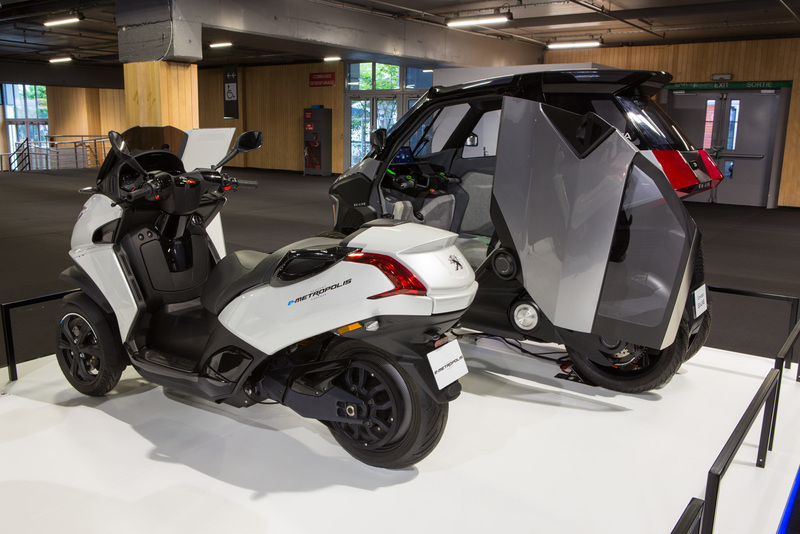 “E-powered” by GenZe, Peugeot 2.0 embodies a legacy, and above all, the future, combining state-of-the-art technologies developed in the very heart of Silicon Valley. Peugeot 2.0 is the first vehicle to integrate clean technologies, such as its 3G SIM card provided by AT&T, the American operator present in 200 countries. Since August 25th, Peugeot 2.0 electric scooters are available in the streets of Antwerp via the Poppy app. The principle is identical to that of shared cars: Peugeot 2.0 electric scooters operate on a “free floating” basis. As a result, shared scooters are not limited to fixed parking locations, and users can park their scooters at any time for free in the Poppy “homezone”. Peugeot 2.0 operates to the rhythm of its driver, and includes a touch screen and a 3G card. No additional accessories are required; even having a phone at hand is not required to manage the connection (no bluetooth connection). This vehicle is connected to a cloud solution, to manage the vehicle's data in real time, immobilize and geolocate the vehicle. Everything is available via an online portal for professionals or a smartphone application for consumers, for a quick start and access anywhere. With a 2 kWh removable Lithium-ion battery (with integrated charger), Peugeot 2.0 embodies real performance. With a maximum power level of 3.2 kW, this engine offers excellent performance for accelerations and hill- start assistance similar to those of a 50 cc 2- strokes engine. Three different driving modes offer drivers a choice that best suits their driving style. 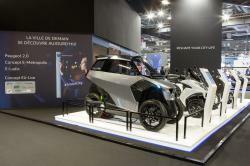 Peugeot 2.0 accelerates from 0 to 30 mph in about 10 seconds. 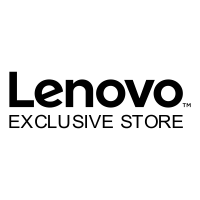 Handling and customizable storage. With its 16- inch front wheel, large load capacity and center stand, Peugeot 2.0 is light and easy to handle. Six attachment points on the rear trunk can easily adapt the scooter to many loading formats. 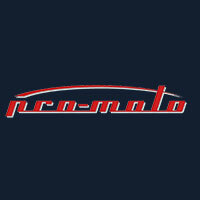 Front and rear hydraulic disc braking system: Powerful, progressive and easily controllable for improved safety. Ideal for professional fleets. Its robust design, large loading capacity (up to 90 liters in Cargo version) and connected functions will satisfy different types of professionals. From food to express parcel delivery, or even after-sales service, it will also satisfy service companies, scooter rental companies, even municipalities and restaurants, and deliverymen. 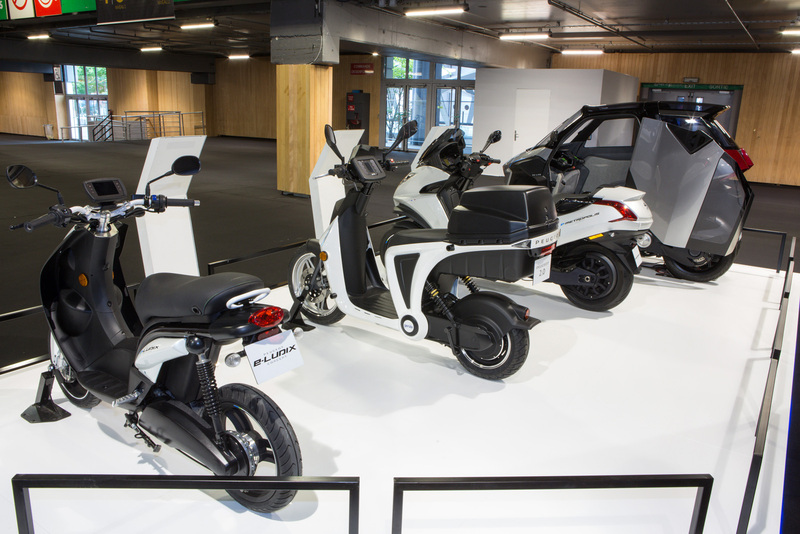 With more than 250,000 scooters produced in 15 years, Ludix is a bestseller whose reliability and wide range have contributed to its reputation. 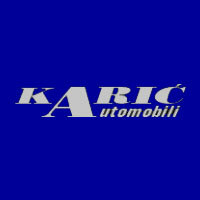 It is a best-selling product in the 50 cc range that has existed in a multitude of versions. 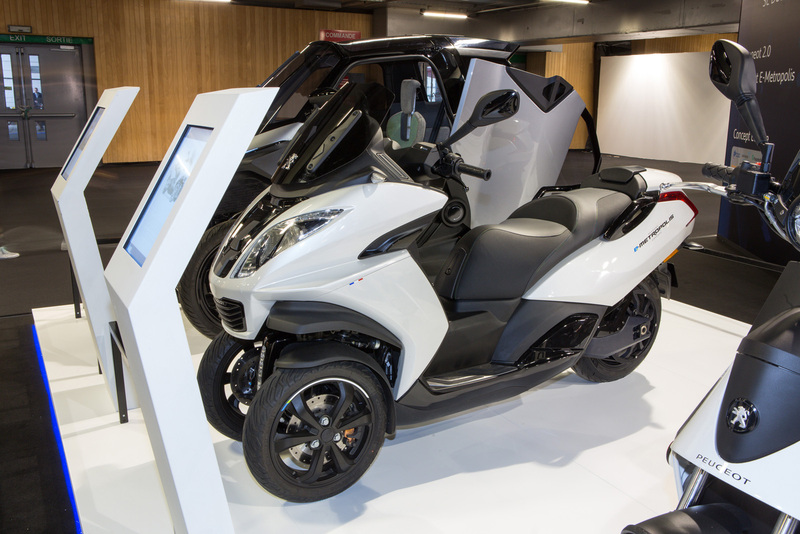 Building on this success and flexibility, Ludix is now evolving towards a brand new electric version, demonstrating once again the appetite of Peugeot Motocycles for the design of vehicles centered on new mobility. 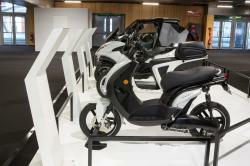 With E-Ludix, the brand expands its 3rd generation electrical offering to 2 vehicles in 2 years. 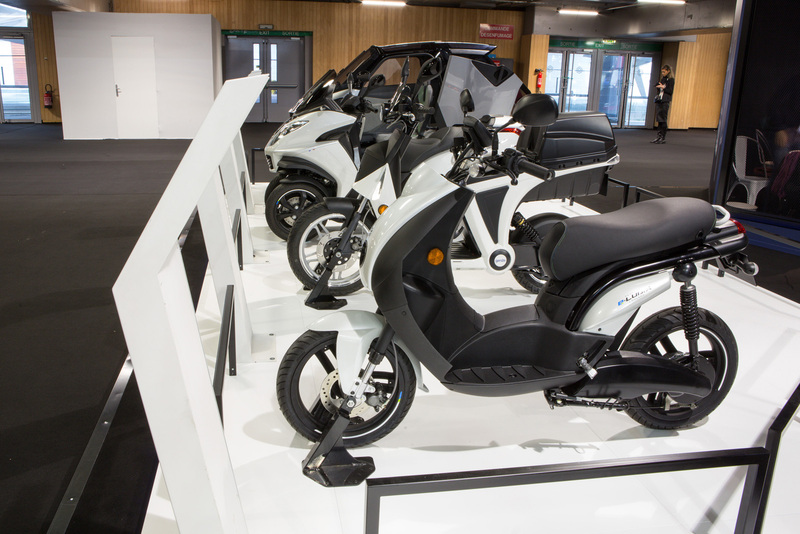 Introduced during the Mondial de Paris Show, E-Ludix fits in the category of license-free 50 cc equivalent scooters, accessible from age 14 and up. As the regulation requires, the top speed is limited to 30 mph. Very light at only 187 lbs, including 20 lbs of battery on the center stand, the scooter is very well motorized with the latest generation Bosch central engine produced in Europe. With its remarkable vibrancy and compactness, this two-seater scooter with a continuous power of 3 kW (4 hp) will seduce a young and urban clientele. Concerned with the quality of its batteries, Peugeot Motocycles equips E-Ludix with a Lithium-ion battery supplied by Bosch. Like Peugeot 2.0, it is removable to allow indoor charging (and is easily transportable, weighing only 20 lbs). It offers a range of up to 31 miles, and include a braking energy recovery system. Charging takes about 3 hours using an external charger. Peugeot Motocycles introduces the world's first electric version of its 3-wheel Peugeot Metropolis maxi scooter. The E-Metropolis concept features high level performances intended to make it the new reference in major European cities, where it already had the opportunity to shine. 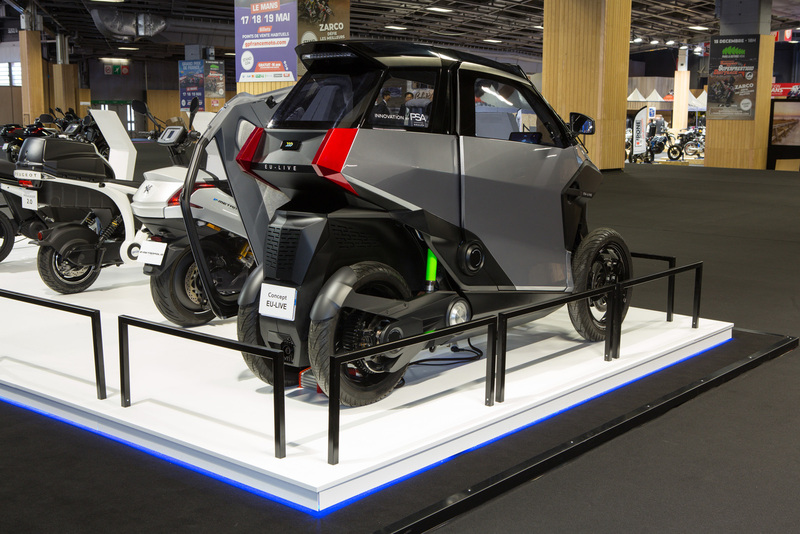 Indeed, just a few days ago on Sunday, September 30, E-Metropolis proudly paraded during the Mondial de la Moto Show for the 120 years anniversary celebration of both the show and Peugeot Motocycles. What better symbol for the brand than to pay tribute to its fans and its history by unveiling its vision of future urban mobility as a world premiere! The electric motor installed on the chassis delivers 36 kW of maximum power to the rear wheel using a timing belt. The maximum speed announced is 85 mph, with a range of up to 125 miles. E-Metropolis offers the best features in its segment. A 3 kW on-board charger is installed behind a trapdoor between the front lights. A type 2 plug provides 80% charging capacity in less than 4 hours. 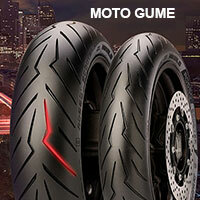 Finally, E-Metropolis adopts a new rear suspension with central Öhlins mono-shock. Like Peugeot Metropolis, this concept falls into the category of 3-wheel scooters accessible with a driving license for cars. E-Metropolis provides an exceptional driving experience. With its electric engine, the weight of the vehicle is therefore lighter and seemingly suspended, which gives the driver a feeling of driving in levitation. Driving enjoyment, safety and performance, are the main assets of the future E-Metropolis, the new flagship of the Metropolis range. 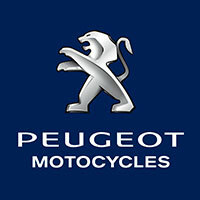 Peugeot Motocycles has been committed to advancing mobility for 120 years. This is why the company's R&D department, in collaboration with 11 partners, joined a European consortium to meet the challenges of tomorrow. 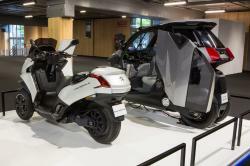 EU-LIVE (Efficient Urban LIght VEhicle) challenges itself to develop and design new electrified mobility solutions, supported by the European Commission as part of the “Horizon 2020” research and innovation program. 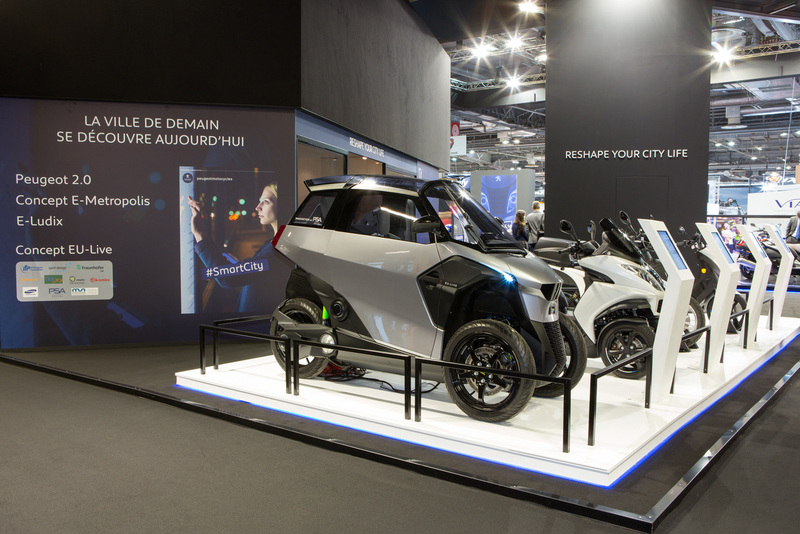 In this context, Peugeot Motocycles wanted to pay tribute to this project by including on its booth at Mondial de la Moto Show the L5e category vehicle presented on November 30, 2017 by the EU-LIVE consortium, and reaffirm its vision for the future. 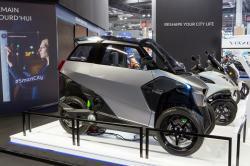 The EU-LIVE concept is a rechargeable hybrid quadricycle in the L5e light vehicle category, positioned between 2-wheelers and 4-wheelers, and accessible without a motorcycle license. Intended for both streets and motorways, it holds 13 patents, half of which relates to the tilt mechanism and roll management, based on hydraulic components and hydropneumatic suspension. EU-LIVE combines a 42hp single-cylinder engine with an electric motor (10.5Kw). The battery of the electric motor can be recharged by recovering energy during braking. 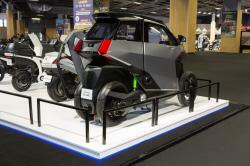 In zero emissions mode, the quadricycle can operate at up to 45 mph via two motors located in the rear wheels. Beyond that speed, the combustion engine takes over for up to 80 mph. 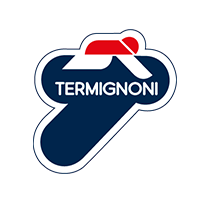 Its traction belt, designed in collaboration with IFP Energies Nouvelles, comes directly from the Peugeot 40 cc PowerMotion engine that equips the Peugeot Metropolis 3-wheeler. Total autonomy up to 185 miles, including 15 miles in 100% electric mode. The fully enclosed and heated interior accommodates up to two passengers, one sitting behind the other. Passengers can easily exit through swiveling doors allowing perpendicular parking closer to the sidewalk. With all these features, EU-LIVE allows Peugeot Motocycles to solve the two major challenges of motorcycles: safety and vulnerability to bad weather.